Rayden the radiant — Rayden the ravishing! 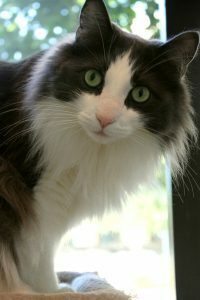 I am Rayden, the 3-year-old eye-catcher that you’re sure to fall in love with! I’m a young boy kitty that is very confident and social, and it didn’t take me long to start to really show my personality here in the Pixie cattery. 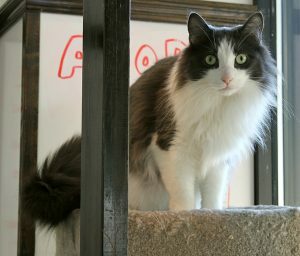 As is typical for a kitty my age, I am very curious and love to check out new people, new sights and sounds, and new toys. I’m very tolerant and would probably thrive in a home with lots of entertainment and enrichment, whether it be with a family or a single person or couple. I came to Pixie with another kitty and am living peacefully in the Pixie cattery, but I don’t seem to need other cats around. I’d probably do fine with time to adjust to other animals in the home, but I’d be just as happy to be the King of my Kingdom as well! I think royalty suits me, don’t you? I’m just a pretty boy with a soft heart waiting to find my purrfect match. Are you looking for a boy like me? Come down to Pixie today! I come to you fixed, vaccinated, and micro-chipped for an adoption fee of $100.